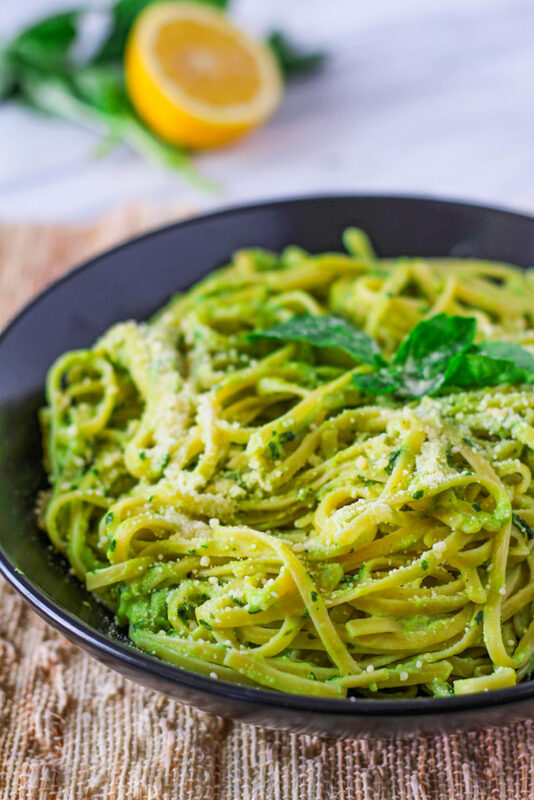 A quick pasta sauce made of avocado, fresh basil, garlic, lemon and olive oil is the perfect way to bring the taste of summer to anytime of the year. Serve this avocado fettuccine for dinner with a side salad for a comforting, healthy meal! If you’re looking for a quick weeknight dinner, this is for you! This creamy avocado sauce is so simple– everything comes together in the food processor in seconds. 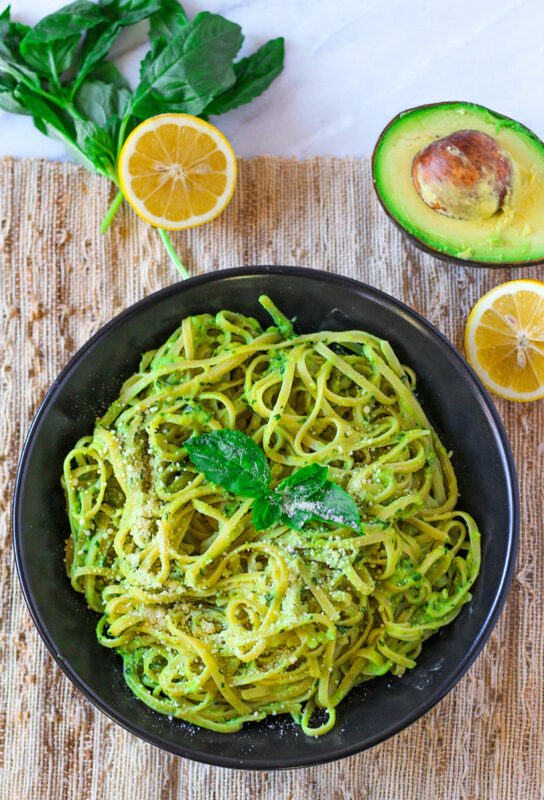 The avocado, basil and lemon are perfect for a summer dinner! My favorite thing about this pasta dish is that I can make the sauce AND a side salad, all while the pasta is cooking. A whole dinner on the table in less than 10 minutes? Perfect! I made you a video to show you how simple this is. I added cherry tomatoes for a little color– you can do this as well or leave them out! What a comforting dish! Creamy avocado reminds me of an alfredo sauce, but without the heaviness that comes from the cream and cheese. There’s a little parmesan in this sauce, but it’s mostly the flavors of avocado and basil that stand out the most. In a food processor, combine the avocado, basil, garlic, lemon, salt, pepper, olive oil and parmesan cheese. Puree until smooth. Toss the cooked pasta along with the sauce. Make sure you serve this immediately. If you save it for leftovers, there's a chance the avocado might turn brown. This looks amazing!! I love avocado.. and lemon + basil is such a great flavor combo! Thanks! It’s one of the tastiest combos! I love this idea and that it is so simple to make! Pinning! yum! definitely trying this, I just got a new food processor and I need to use it more often! Yes, use that food processor! So useful for many things!